Green Cottenham had just been arrested for vagrancy in Shelby County, Alabama. But in that era of the American South, when unemployment among Euro-American males was endemic, the application of the so-called vagrancy law was reserved exclusively for African American males. The reason went beyond racism. The law represented the reintroduction of slavery. Cottenham was unemployed, even though there was actually work to do in the mines. But US Steel didn’t have to hire him. They merely had to wait for the sheriff to arrest him for being unemployed. Then, with a nearly a one-year sentence of hard labour assessed against him for this non-crime, US Steel could buy Green Cottenham from the country at the rate of $12 dollars a month. They purchased many such African men from the sheriffs of Alabama. Here is a description of what happened to Green a few hours after the company purchased him. That is how US Steel got its coal in 1908. By purchasing slaves from a totally corrupted legal system. Which did not start to get dismantled until after World War II. 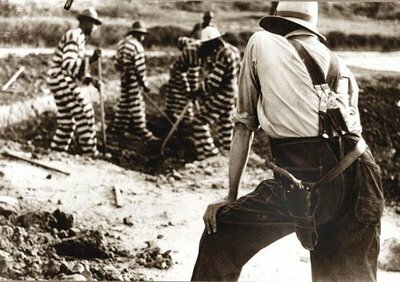 The convict leasing system is still enforced today under another name-disproportioned sentencing! This is another reason, slaves should have received 20 acres and a mule. if nothing else they should have received this. can anyone justify why our state and federal government condone this horrible atrocity to a people that just aquired their freedom through the 13th amendment. This country is responsible for the negative repercussions of Slavery prior to, during and after reconstruction up to world war two.